Varona Hair Restoration in Newport Beach offers the most advanced techniques to expertly restore hair for the beard, mustache, sideburn, and eyebrow areas. 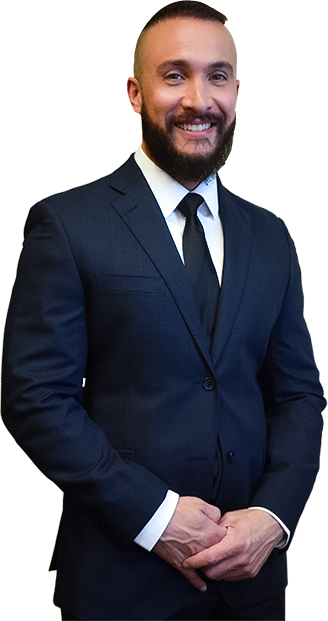 Whether you’d like to fill in thinning eyebrows or you’ve never been happy with the fullness of your beard, Dr. Christopher Varona can create a custom treatment plan to achieve your goals. Dr. Varona is renowned for his expertise and artistry with the leading hair restoration techniques, and he has helped thousands of patients regain their self-esteem with these procedures. Discover how facial hair transplant surgery in Newport Beach can improve your appearance and help you reclaim your confidence. Contact Varona Hair Restoration to schedule your consultation for facial hair implants in Newport Beach. Facial hair implants are typically performed using either FUT or FUE hair restoration surgery. If you elect to undergo FUE surgery, the hair grafts will be individually extracted from the back of the head. The techniques used by Dr. Varona ensure minimal scarring. He uses specialized tools to harvest grafts with a punch size as small as 0.7-0.8 mm. This means you won’t have to worry about visible scarring on the back of your head, making this procedure a popular choice among our young male patients. Once the grafts have been harvested, Dr. Varona will carefully prepare the recipient sites on the desired areas. During this step, tiny incisions are meticulously made so that the depth, angle, and direction of the transplanted hairs can be controlled. This ensures the hair transplants look as natural as possible and blend in with the surrounding hairs. Depending on the patient’s hair type and cosmetic goals, FUT surgery may also be used. The primary difference with FUT surgery is that a strip of tissue is surgically removed from the back of the head, and the hair grafts are dissected from this tissue. This procedure does produce a linear scar, but it is easily concealed if the patient chooses to wear a long hairstyle. Dr. Varona prides himself on being one of the few hair surgeons who performs the graft extractions manually with precision and speed. Is a Facial Hair Transplant Right for You? The beard, mustache, and sideburns can help frame your face and highlight your features. Some men notice their facial hair has thinned over time, while others never had the fullness that meets their aesthetic goals. Dr. Varona can help you achieve a masculine look with facial hair implants for the beard, mustache, and sideburn areas. This procedure is also a popular option for our FTM transgender patients who are seeking facial masculinization. The eyebrows play an important role in facial aesthetics in both men and women. Depending on your facial shape and desired look, Dr. Varona will closely work with you to design a treatment plan that accentuates your features and highlights your eyes. Whether you’d like a more defined arch, or you want to fill in patchy areas, facial hair implants for the eyebrows can significantly enhance your overall look. Our MTF transgender patients also find this procedure an excellent option for achieving a feminine appearance. At your initial consultation, Dr. Christopher Varona can help you explore complementary treatments that may also encourage healthy hair growth on the face, such as PRP therapy. Based on your preferences and ultimate cosmetic goals, you will be provided with a personalized treatment plan tailored to your needs. 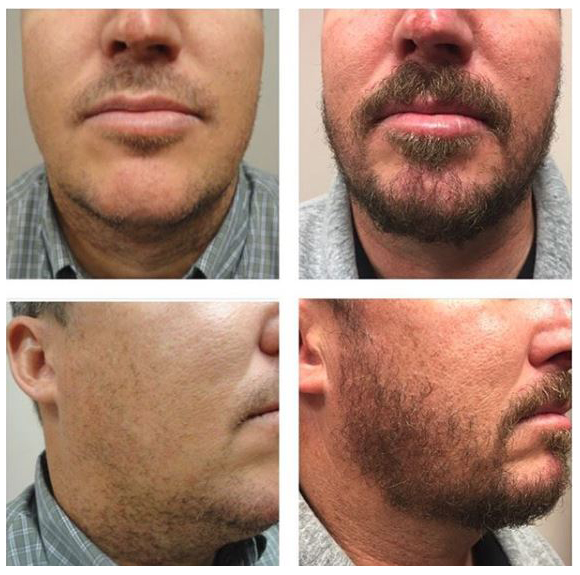 This patient had sparse fine facial hair and desired a stronger beard. I transplanted 2300 grafts by a hand FUE technique. Second pics were taken after 12 months. Facial hair implants typically do not require a lengthy recovery. If your procedure was performed using FUE surgery, mild pain and swelling is expected for the first few days. Recovery from FUT surgery is usually just a few days longer, and scabbing forms around seven to 10 days after the procedure. Patients typically resume non-strenuous activity by the second day after facial hair transplant surgery, but exercise should be avoided for a week. These procedures produce long-lasting results. The transplanted hairs are taken from the back of the head, which is an area that is genetically programmed to resist balding. As a result, the transplanted facial hairs will have the same growth behavior and will be less likely to thin out. When Can I Shave After a Beard, Mustache, or Sideburn Transplant? It’s generally recommended that patients wait about two weeks before trimming their transplanted facial hair and at least four weeks before shaving.